Gary Guyton is an American football linebacker for the New England Patriots of the National Football League. He was signed by the Patriots as an undrafted free agent in 2008. He played college football at Georgia Tech. Gary Guyton was signed by the Patriots as an undrafted free agent on May 2, 2008. * Was credited with his first sack of the season, a 10-yard loss for the Steelers in the first quarter, as well as three tackles and a pass defensed (11/14). * Made one tackle against the Browns (11/7). * Played in a reserve role against Minnesota (10/31). * Played as a backup linebacker and made seven tackles against the Chargers (10/24). * Registered two tackles in a reserve role against Baltimore (10/17). * Made four tackles and one special teams tackle against the Dolphins (10/4). * Registered five tackles and a quarterback hit in a reserve role against the Bills (9/26). * Started at inside linebacker against the Bengals and scored a touchdown on his first career interception, a 59-yard return of a Carson Palmer pass (9/12). * Matched his season high in tackles, making five stops against Pittsburgh (11/30). * Made his first career start in the Patriots' comeback win at Seattle (12/7) and followed by his second at Oakland (12/14). * Started all 16 games at inside linebacker and finished second on the team with 91 total tackles, 1.5 sacks and four passes defensed. * Made a career-high 13 tackles at the N.Y. Jets (9/20). * Registered first sack of his career at Buffalo and then had a half a sack vs. Jacksonville in back-to-back games (12/20 & 12/27). * Started in the postseason game vs. Baltimore (1/10) and finished with five total tackles. * Played in 14 games with two starts and recorded 26 tackles (22 solo), three passes defensed, two fumble recoveries and seven special teams tackles. * Was the only 2008 undrafted rookie to make the Patriots' opening-day roster. * Made his NFL debut in the Patriots' season-opening win over Kansas City (9/7). * Led the team in special teams tackles with two against Miami (9/21). * Recovered a Patrick Ramsey fumble off of a Mike Wright strip-sack against Denver (10/20) to record his first career fumble recovery. * Tallied a season-high five tackles at Indianapolis (11/2). * Tallied two passes defensed and his second fumble recovery of the season against the N.Y. Jets (11/13). * Made his first career start in the Patriots' comeback win at Seattle (12/7). * Followed with his second straight start at inside linebacker at Oakland (12/14). * Played four seasons at Georgia Tech from 2004-07. * As a senior in 2007, finished second on the team in total tackles with 78 while starting all 13 games and had a career-high five sacks. * Averaged more than one tackle-for-loss per game (1.04). * As a junior in 2006, totaled 29 tackles while making 12 starts at outside linebacker. * Contributed a key 38-yard fumble return for a touchdown in a win at Virginia Tech. * As a sophomore in 2005, made 19 tackles, one sack and one pass defensed. * As a freshman in 2004, saw action in 12 games on special teams. * Gary Guyton, Jr. was born the son of Janice and Gary Guyton on Nov. 14, 1985. * Attended Bradwell Institute (Hinesville, Ga.) where he was a three-year letterman. * Named to the Atlanta Journal Constitution's Top 50 in Georgia. * Compiled 56 tackles, three sacks, three fumble recoveries, five passes defensed and a blocked kick as a senior. * Tallied a career-high 59 tackles as a junior. * Majored in management at Georgia Tech. 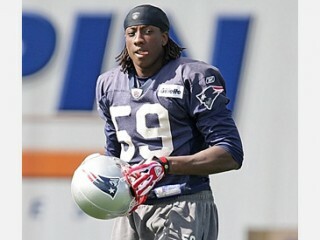 * Gary was the only undrafted rookie to make the Patriots' opening day roster in 2008. He went on to play in 14 games with two starts, becoming the first undrafted rookie linebacker to start for the Patriots since Bill Belichick became head coach in 2000. * Gary had the fastest time in the 40-yard dash by a linebacker at the 2008 NFL Scouting Combine. View the full website biography of Gary Guyton.